The Rock-Ola Bubbler Gazelle CD Jukebox Has All The Same Features As The Original But With A Cool Art Deco Look. 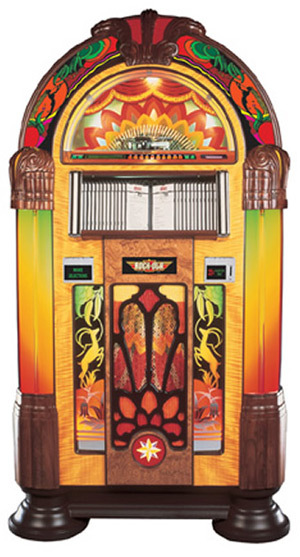 This classic Art Deco CD Jukebox features bold graphics and colorful accents define the Gazelle Rock-Ola Jukebox. Graceful horned beast appear to leap with joy on the screen printed and illuminated glass panels accenting the center grille. Custom printed arch panels and molded wood crown and shoulders complete the slightly sassy art deco inspired cabinet.